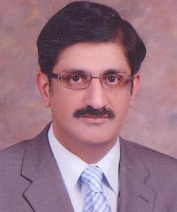 Murad Ali Shah was born on 11 August, 1962, in Karachi. He was schooled in Karachi where he bagged his engineering degree from the NED University of Engineering and Technology. He got a job of junior engineer in the Water and Power Development Authority (Wapda), engineer at the Hyderabad Development Authority and later worked as executive engineer at the Port Qasim Authority. He was also a project director of the fish harbour authority. Then he left for the US where he assumed masters degrees of engineering-economic system and civil and structural engineering from Stanford University in the 1990s. He contested and won the constituency of his father from a small town of Jhanghara in 2002 general elections, now in Jamshoro district, and became an integral part of PPP's think tank to analyse and oppose the provincial government backed by the then military ruler Gen Pervez Musharraf. His increasing interest in financial matters and rules of business of the assembly won him key position in the party, which paid dividends in the latter years when the PPP formed its government in Sindh. His increasing interest in financial matters and rules of business of the assembly won him key position in the party, which paid dividends in the latter years when the PPP formed its government in Sindh. After winning the same constituency in 2008 he was made the minister for irrigation in Syed Qaim Ali Shah's first stint as the chief minister. Later, he got the portfolio of the finance ministry that he has been overseeing till date. In between he was disqualified from the assembly seat for holding dual nationality. He surrendered his Canadian nationality and contested the elections again though he remained adviser to the chief minister for finance during this period. He finally assumed his ministry after winning the by-election. The oath-taking ceremony took place at the Governor s House. Sindh Governor Dr Ishrat ul Ebad Khan took the oath whereas a number of party leaders, including PPP Chairman Bilawal Bhutto, former Prime Minister (PM) Syed Yousaf Raza Gillani, former Sindh CM Syed Qaim Ali Shah, Leader of the Opposition in the National Assembly (NA) Syed Khurshid Shah, and others. Pakistan People s Party (PPP) candidate Syed Murad Ali Shah was elected as new Sindh Chief Minister (CM) on Friday after securing the required number of votes.